Looking for things to do in Maui during your vacation? Use our Local Area Guide to activities and events for your family and friends while staying with I Go Maui Vacation Rentals & Realty Vacation Rentals. Whether you enjoy relaxing on the beach, viewing wildlife, exploring the island, or good food, people of all ages will find many different options while staying in one of our vacation homes. Renting a car in Hawaii has never been this easy or affordable! We highly recommend Discount USA Car Rental which offers easy online booking anywhere in the United States. There is no prepayment, no cancellation penalties, and no booking fees. You`ll also receive great customer service, access national major brands, and your reservation is guaranteed. Welcome To Maui! Known as the "Valley Isle", Maui is dotted with quaint towns, artist communities and local favorites that have been around for generations. Head to Wailuku for pastries from a "mom and pop" bakery, or head to Lahaina for a taste of Maui`s famed farm to table cuisine. From shimmering beaches and sacred Iao Valley to migrating humpback whales and sunset on Haleakala, it`s not surprising Maui was voted the "Best Island" by the readers of Conde Nast Traveler for more than twenty years. Enjoy a plethora of activities and tours in Maui on your next trip! From parasailing to hiking the lush valleys, there is something for everyone. Check out our recommended things to do in Maui below, perfect for your next vacation here with friends and family. Traveling to Hawaii with the gang? Explore a variety of family activities in Maui. From bumper boats to mini golf there is plenty to keep the kids busy! Check out our recommended family-friendly activities around Maui below, perfect for your next visit here! Looking for some of the best restaurants in Maui? Maalaea Harbor features good food and restaurants, from casual to fine dining. Conveniently located within walking distance from our vacation rentals, you`ll enjoy a variety of cuisines during your stay here. Check out our recommendations below! 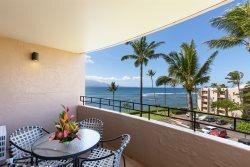 If you`re looking to go on vacation and enjoy everything from beautiful, sandy beaches to unique, rugged lava shorelines, then Maui is the perfect location to spend your vacation. The beaches of Maui are perfect for enjoying warm weather and water, snorkeling and scuba diving, long walks and hikes, swimming and surfing, or just relaxing and soaking in rays of sun. Here are our top 5 beaches in Maui that we recommend visiting. For more information about the best beaches in Maui, check out our recommended resource guide below.